Creamy peanut butter filling sandwiched between two crispy peanut butter cookies. This recipe will be a favorite of all your peanut butter lovers. Preheat oven to 350 degrees F. Prepare cookie sheets by greasing lightly. Combine the brown sugar, white sugar, peanut butter, shortening, salt, baking soda, and vanilla; beat until smooth. Add the egg and beat until mixed in. Stir in the oatmeal and flour until mixed in evenly. 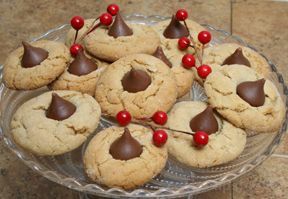 Drop dough by teaspoons on the prepared cookie sheet, placing them about 1 1/2 inches apart. 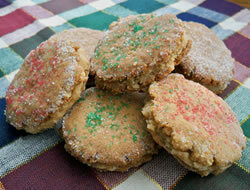 Dip the bottom of a glass in sugar and flatten the cookies until about 1/4 inch thick. Sprinkle lightly with fine salt. Note: You can use colored sugar for the holidays. Place in the preheated oven and bake for approximately 15 minutes or until lightly browned. Combine all the filling ingredients and stir until smooth. Spread the frosting on the bottom of half of the cookies and then top with the other half to create the sandwich cookies. "A co-worker brought these in and I loved them. I had to get the recipe because I'm sure my family will too!" "I made these at Christmas time. We loved them. 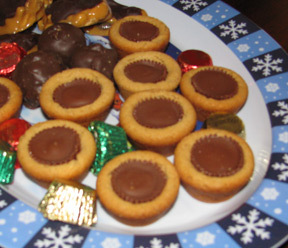 They had a crispy peanut butter cookie top and bottom with a yummy peanut butter center. I will make again sometime."